So I decided I didn’t want to be the only person on the planet who hadn’t read Saga anymore. I’ve been seeing it all over the place, and I’m not exactly sure what took me so long to give it a go because it’s all the things I love in a comic – funny, heartfelt, beautifully drawn, and incredibly engaging. 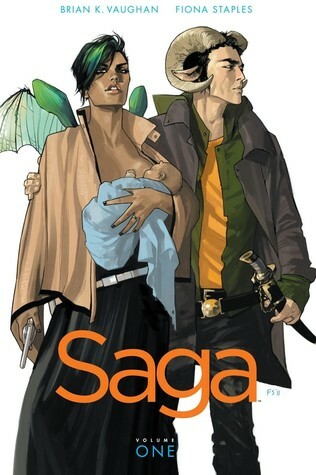 Saga is about our two main characters Alana & Marko – and their daughter Hazel. Alana is from Landfall and Marko is from Landfall’s moon, known as Wreath. Landfall and Wreath have been at war for basically forever (“if there was ever a time these two got along, nobody remembers it”) so Alana and Marko are supposed to be enemies. But, they fall in love and have a child. Now they are on the run being chased by agents/bounty hunters/allied nations working for the governments of both their home worlds when all they want to do is find a place to raise their daughter in peace. The best part? The story is actually narrated by Hazel. Hazel’s narration, for me, really pulls the narrative together and pushes it forward. The explanatory information is helpful to understanding the story while providing insight and heart. It seems to ground the story and raise the stakes so to speak. This comic is also full of great characters (Izabel), complex characters (The Will), and terrifying characters (The Stalk). And there are plenty of worlds introduced that I can’t wait to see explored in future volumes – as well as character development I am sure is to come. However, I will warn you that this is an adult series so there is lots of swearing, violence, and some sexually explicit scenes. I really felt like it worked for the story being told, so they didn’t seem too gratuitous for me, but if that’s not really you thing you may want to give this a pass. The upside to being so late to give this a go? I’ve not the next five volumes waiting for me – and Volume 7 comes out in March. I can’t wait to see where the story goes next!